Cereals are good for you, supplying the body with carbohydrates, proteins and vitamins. Yet some people are intolerant to the gluten protein they contain. Now, researchers are developing new recipes for tasty, gluten-free pasta and pastries. Not every person can eat what they like; far from it, one in every 250 people in Germany is intolerant to the protein gluten, which is chiefly found in the cereals wheat, spelt, barley and rye. Experts call this intolerance coeliac disease. For those affected, this means giving up bread, pizza, pasta and cakes, while ice cream wafers, dumplings and pretzels also pass onto the list of banned foods. Those suffering from coeliac disease, a chronic bowel disorder, must keep to a strict diet if they are to avoid diarrhea, stomach ache, vomiting and other symptoms. Accordingly, only gluten-free products make it onto the menu. Indeed, demand for these food products, mainly offered by small and medium-sized enterprises (SMEs), has risen steadily over the past years. Nevertheless, many consumers dislike gluten-free pasta and bakery products because they are unappetizing, lacking in texture and leave a disagreeable sensation in the mouth. This is a view confirmed in consumer tests involving coeliac disease sufferers and healthy volunteers. The tests form a key part of the EU project GlutenFree (www.glutenfree-project.eu), which is being coordinated by the Fraunhofer Institute for Process Engineering and Packaging IVV in Freising. Partners include ingredient providers and food producers as well as research institutes from Germany, Ireland, Italy and Sweden. The aim of the project is to enable SMEs to develop premium, tasty gluten-free products that the consumer will eat with real enjoyment and satisfaction. The focus is primarily on bread and pasta, and on improving their taste, smell, appearance, texture and sensation in the mouth. Gluten is good for baking because it holds the dough together. "Gluten contains two protein fractions, the gliadins and the glutenins. These form a network-like structure – the dough matrix, if you like – giving the dough good porosity and a viscoelasticity that allows it to keep its shape and remain elastic in the baking process", says Dipl-Ing. Jürgen Bez, scientist at IVV. Gluten-free bakery products dry out more quickly, crumble more easily and have a shorter shelf-life. Pasta without gluten overcooks more quickly, and is sticky and less elastic. "As a result, finding ingredients to compensate for gluten's positive properties is a challenge", says Bez. The process begins as early as the selection of raw materials: quinoa, for instance, often produces a bitter taste. 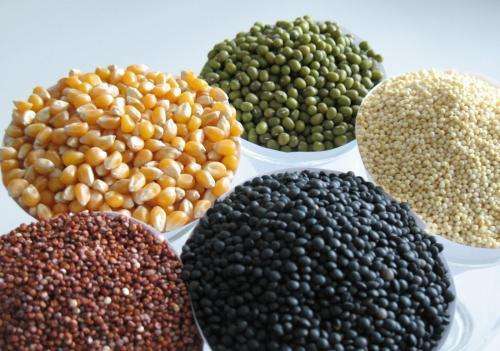 Nevertheless, researchers have been successful in finding ingredients such as plant proteins, which lend pasta and bakery products the same structuring effect as the protein gluten. Hydrocolloids like xanthan gum, HPMC and dextran have all been examined carefully, as well as seeds taken from cereals and pseudocereals like amaranth, quinoa and buckwheat. In addition, scientists analyzed protein isolates taken from potatoes and pulses like lupins, broad beans and peas, as well as investigating the interaction of a variety of recipe ingredients during the production process, and the ways in which this affected texture, sensory properties and aroma profile. A whole range of recipes were tested; for example, researchers combined proteins with soluble fibers like xanthan gum and HPMC or with insoluble citrus fibers. "Adding the hydrocolloid xanthan gum succeeds in giving dough a particular elasticity, though here the end result is heavily dependent on the concentration, the proportion of water, the type of flour and the other ingredients. Getting the right combination is crucial", summarizes Bez. "As a rule, hydrocolloids alone are not enough to offset the lack of gluten, and proteins need to be added to recipes." Thanks to a special production technique, scientists are able to extract a protein isolate containing viscoelastic properties from the seeds of lupins and broad beans. This was another technique developed by Bez and his team at Fraunhofer IVV. "By adding lupin proteins, we were able to improve the volume of baked goods", says the researcher. Scientists also established that adding sourdough helps prevent loaves from going moldy so quickly, observing that dough becomes more elastic and that loaves stay fresh for longer. What's more, some gluten-free flours are more nutritious than wheat flour. Test subjects rated oatmeal, rice flour and teff flour particularly flavorsome. Bez considers the project a success, pointing to project partners' success in producing a range of new and improved gluten-free breads, including toast bread, leavened bread and oat wholemeal bread, ciabatta, baguettes and pizza dough. Four of the baked goods producers involved in the project are already using the recipes for ciabatta, wholemeal bread and pizza dough. Furthermore, researchers were able to produce tasty, gluten-free spaghetti with a high fiber and protein content. Bez is confident that it won't be long now before we see some of the new products lining bakery and supermarket shelves.